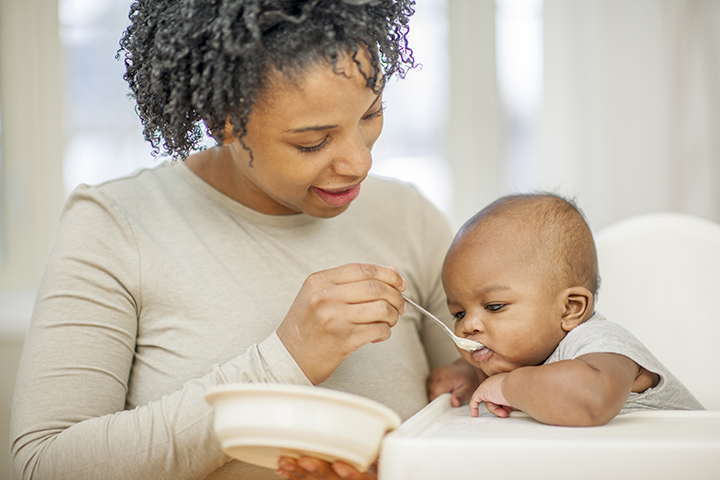 Health Canada now advises that first solid foods for infants be iron-rich. By about 6 months of age, baby should be served pork, meat, fish, poultry, or meat alternatives daily. WHY? Baby needs iron for optimal brain development and growth. At 6 months baby’s iron stores are depleted so a food source is needed. Pork is one of nature’s best sources of iron. In a major departure from conventional advice, new Canadian guidelines say parents should be offering their six-month-old infants pork, meat, fish, poultry or meat alternatives two or more times a day on a daily basis. The guidelines state iron-rich foods should be the first that babies consume when being introduced to solids. The iron-rich foods recommended include pork, meat, poultry, fish, eggs, tofu, legumes and iron-fortified infant cereals. Frequent consumption of pork, meat, poultry and fish, can contribute considerably to meeting infant iron requirements because the heme iron provided by animal sources is more readily absorbed than non-heme iron found in plant-based foods such as infant cereals. The recommendations are groundbreaking. Previously, it was recommended that babies start out eating infant cereals, followed by fruits and vegetables, then meat as they transition to solid foods. But when you look at the science, there is no reason to do that. The rationale for this change in infant feeding practices is two-fold. Firstly, iron is critical for a baby’s growth and cognitive, neurological, motor and behaviour development. Secondly, by about six months, a baby’s iron stores start to diminish and those solely fed breast milk will not meet their iron requirements and are in danger of becoming anemic or iron-deficient. Iron deficiency during infancy and childhood may affect proper brain development, which is irreversible. Pureeing meat is as simple as making fruits and vegetables into baby food. However, pureed meat for babies should not contain added salt, sugars or oils. At first, a portion size of meat recommended is about one or two tablespoons at each meal. The amount of food offered should be guided by the infant's hunger and satiety cues. Nature has provided delicious, iron-rich pork perfectly compatible with the way humans absorb iron – very efficiently. Adding meat to a meal also helps our bodies absorb up to four times the amount of iron from other foods like green vegetables, bread and cereals. Given the small size of baby’s stomach, serving meat at each meal make good nutritional sense. People enjoy an abundance of nutritious foods, which, if eaten in balance and moderation, have allowed us to develop and thrive. Let’s face it; some couple of hundred years ago there was no conveniently boxed rice or wheat powders artificially fortified with iron just so babies would meet their iron requirements. Why serve these products when nature has provided delicious, iron-rich foods perfectly compatible with the very efficient way humans absorb iron when it is from an animal source. Meats are an anchor in a healthy meal for the family. 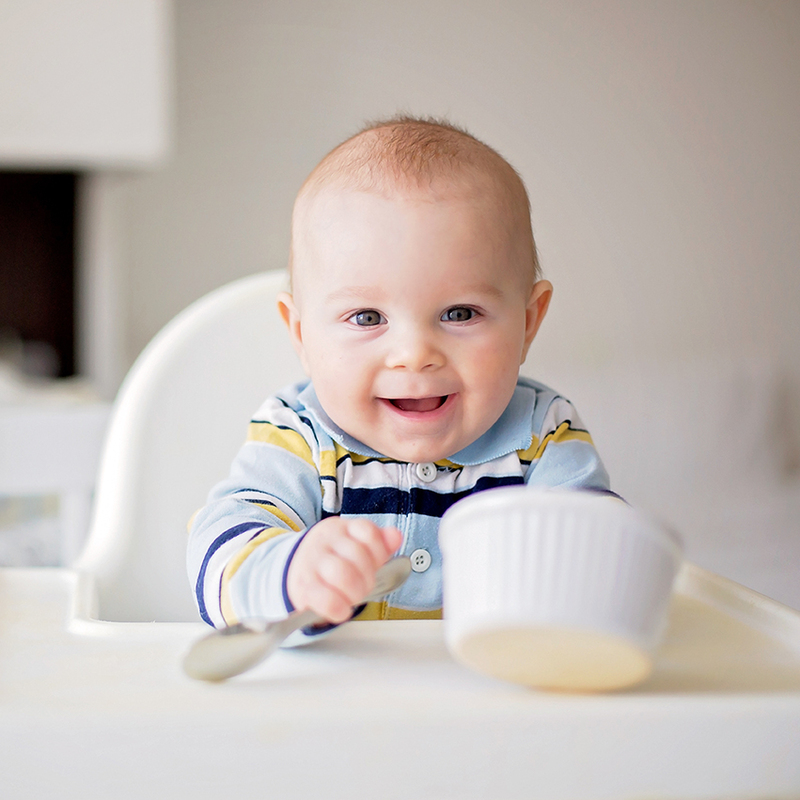 Now six-month-old infants can (and should) enjoy meats as the foundation of their meals too. In a study published last December in Pediatrics, scientists at Umeå University in Sweden found iron supplements may help boost brain development and ward off behavioural problems, like ADHD later in life, in low birth weight infants. Low birth weight babies are more likely to end up iron deficient and need more of the nutrient for catch-up growth. In the randomized controlled trial, researchers followed 285 infants born between 4 pounds, 7 ounces and 5 pounds, 8 ounces. When the babies were six weeks old, the researchers randomly assigned them to get iron drops or iron-free placebo drops each day until their six-month birthday. Then at age three and a half, the children were assessed for intelligence and their parents were surveyed about their offspring’s behavioural issues. The researchers compared kids in the iron- and placebo-drop study groups with another 95 children who were born at normal weight. There were no significant differences in IQ between the low birth weight groups whether on the iron regime or not, and the normal-weight control group. However, significantly more babies given placebo drops had behavioural problems, as reported by their parents. The issues included problems managing emotional reactions, anxiety and depression, as well as sleep and attention problems. The researchers suggest a causal relation between infant iron deficiency and later behavioural problems. They are continuing to monitor the same group of children as they get older, to see if new cognitive or behaviour problems develop or old ones get better. It is important for all parents meet with their health care provider to discuss their baby’s iron requirements. Sourced from Globe and Mail, Reuters and information provided by Karine Gale, RD, Canada Beef Inc. Nutrition for Healthy Term Infants - Recommendations from Birth to Six Months (A joint statement of Health Canada, the Canadian Paediatric Society, Dietitians of Canada, and Breastfeeding Committee for Canada, September 2012). Effects of Iron Supplementation of LBW Infants on Cognition and Behavior at 3 Years, Pediatrics 2013; 131:1 47-55; published ahead of print December 10, 2012, doi:10.1542/peds.2012-0989.